On the way southwards from Kinnegad a number of structures were noted in passing, including a castle (N550440), a barrow and two raths (N490430, N450394). The first stop was at Tyrellspass Castle (N412375). This is an inhabited tower-house with modern additions. The tower-house has two corner bartizans and the remains of a bawn wall with a round turret that has a small decorated window. We continued to Roscrea, noting a rath (S126978) near Leap Castle (S128972), a tower-house with later additions and alterations. Another rath was noted in passing (S144941). At Roscrea the castle and Round Tower were noted (S135892, S137893). Holy Cross Abbey (S088543) was visited. The restored church has many fine windows and the external decoration includes some heads, animals and foliage. Inside may be seen traces of some early frescos. Some of the pillars in the church have many small carvings including some knots. There are three piscinas and an ornate sedilia. The mill close to the abbey has remains of a stream wheel. Inside are the remains of gearing and at least three pairs of millstones. There is a fat carved head over the doorway. Lunch was taken near St Patrick’s Rock, Cashel (S074408). The entrance building has been restored as the Vicar’s Choral. Inside are a number of carved stones on display. These include a sheila-na-gig, originally in the cathedral, and a replica of the High Cross. The buildings on the Rock include Cormac’s Chapel, an early Romanesque church, a Round Tower, a large cathedral and a tower-house. The most noteworthy thing about Cashel, apart from Cormac’s chapel, is the number of carved stones visible. These range from the carved heads in the Chapel to the later carvings throughout the Cathedral. There are some very fine box-tombs in the Cathedral, with good weepers. Cahir Castle (S048247) was visited and photographed. It is a large castle built on a rock in the river. It has a large keep with a bawn with three corner towers. One of these is small and round. The other two are rectangular. One of them has three storeys and is almost as big as a tower-house. A flight of steps close to the other leads to the well which is below a circular tower which may be the postern gate. There is another rectangular building close to the opposite corner. The main gate has a machicolation and a portcullis. The room above, which houses the portcullis machinery, may be inspected. Attached to the south wall of the bawn is a larger and later bawn with buildings, now inhabited, which may have been stables. North of Glanworth (R756045) is a simple rectangular church with a central tower. It is greatly ruined but has some very good windows and a simple box-tomb in the eastern half. About 100m south of this are the ivy-covered ruins of another church and a graveyard. 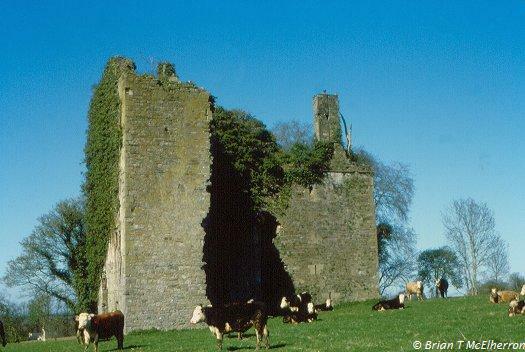 Glanworth Castle (R757041) has remains of a bawn with three round corner towers and one rectangular tower. Close to one wall are the remains of a much ruined tower with a vaulted room at ground level and two latrine chutes. Near the centre of the bawn is a second tower standing four-square but gutted. Restoration work is in progress. A ruined castle (R842008) was photographed near Glebe House. Two walls remain and there are fragments of mural stairways and passages. There is a projecting corner tower with narrow defensive slits. Another castle was noted at R830000 and a third at W825996. Thick fog and drizzle curtailed casual viewing of monuments. The first stop was made at Inchquin Castle (X038748). This is a circular 13th century keep with a good batter. The walls are about 3m thick at the bottom and it is partially demolished on one side. Opposite this gap is a large crack. Despite the poor weather Ardmore Cathedral and Round Tower were located (X190772). The cathedral has a blind arcade on the outside of one gable. The arcade has a number of carvings including the Fall, the Judgement of Solomon and the Visit of the Magi. There are some round-headed windows in the church and inside are a blind arcade and a string course. In the chancel are two Ogham stones. The chancel arch is pointed and the capitals of the pillars are decorated with floral motifs. The Round Tower is intact and has a round-headed doorway with some moulding. There is a string course at each level. East of the tower is St Declan’s Oratory, a small church with lintelled west doorway (blocked) and antae. An unsuccessful search was made for a promontory fort but a large lime-kiln (X166766) was spotted and noted. At the end of a muddy lane, close to a derelict church, are the remains of a tower-house (X080823). There are two walls with some interior walls. A spiral stairway leads to the first floor and the doorway from the stairs has pecked decoration. Inside the main door are two murder-holes at right angles. Just outside and to the left of the door is a small circular turret, possibly part of the bawn. It has been converted for use as a dove-cot. There are remains of a number of later buildings attached to the tower-house. The extensive remains of Molana Abbey (X078827) were examined. These include a church and some other buildings. There is a dried-up well and some hinge-stones were noted at one of the outer doorways. The church has ten lancet windows in the long walls (4 & 6). At one end of the church are the remains of a small rectangular tower (1.5 storeys). A spiral stairway leads to the first floor. The buttresses shoring up the church have a number of rectangular holes in them. Youghal Abbey (X099783) was viewed and photographed. The remains comprise one gable and a small corner fragment. The gable has a large three-light window and the small fragment has some decoration. 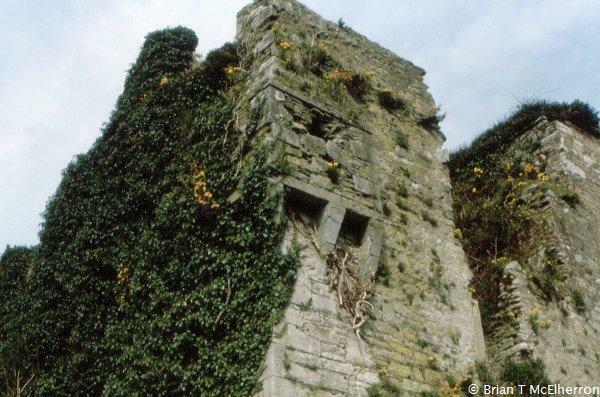 Extensive remains of Youghal town walls were viewed and photographed. Nearby is St Mary’s Church, with a massive detached tower and some carved heads. A roadside well was photographed (X068707). The ruins of Kilcredan Church were visited and the scant remains of an effigy tomb were photographed (X013700). The remains of Shanagarry Castle (W978664) were inspected. There is one wall with a fireplace. It stands close to a derelict house that has two fan-bellows inside. A tower at Ballymaloe House (W949681) was photographed at a distance. Cloyne Round Tower (W918677) was viewed and photographed. The Cathedral (W919677) nearby has a number of carved heads. The remains of a large house (W866715) were inspected and photographed. It has five chimney stacks and three round defensive towers. Two of these are at opposite corners of the main building and the third is at the corner of a small building beside the main block. The scant remains of a castle were spotted (W853705). Just south of Carrigatohill, Barry's Castle (W822725) was visited. It is a large tower-house with corner towers projecting beyond the main walls on two sides. At a third corner is a tower which is almost completely detached. There is a squinch between this tower and the main building. There are some good windows at the upper levels with defensive loops lower down. The ceiling of the first floor room is vaulted. The upper floors are reached by a straight mural stairway. All three of the corner towers have spiral stairways. In two of these the stairways rise to roof level and go down to smaller rooms. Some of these rooms are L-shaped and some are rectangular. The stairway in the third corner cannot be entered from the upper room but may be viewed through a hole in the wall. A small low chamber beneath the top room may be reached by a short flight of steps. Higher chambers may be reached by the stairs in the corner towers. The roof walk is intact but interrupted by a chimney and the corner towers. At roof level on the opposite side of the building is a room with a fine fireplace. Beneath this room is another which is apparently a chapel. Surrounding the castle is a bawn with the remains of three round corner towers. A large rath was inspected (W745650). It is about 50m diameter and is greatly overgrown. Near Ringaskiddy (W773638) a castle, with a more recent house attached, was visited. There is a wall bartizan at one corner and two fireplaces inside, one being a later insertion. Separate form the main buildings is a rectangular tower about three storeys high. In the corner of the main building is a small brick oven. Substantial remains of a castle (W746627), built on a rocky outcrop, were inspected. There are good portions of a bawn wall with a tower standing four-square near one edge. At the other side of the bawn are the remains of a tower with one chimney stack. The main tower is vaulted at first floor level and there are some remains of a straight mural stairway leading to this floor. There are some defensive slits at the lower level. A standing-stone 140cm high by 150cm wide and 50cm thick was photographed. Another stone (W664536) was noted. Mount Long Castle (W676511) was visited. It is a multigabled house (12 of the original 20 gables remain), about half of which is still standing. There are some defensive slits at the lower levels and the upper storeys have a number of mullioned windows, some with transoms. Just south of Kinsale is Charles Fort (W655404), a large artillery fort with least five projecting towers. There are many cannon ports along the top of the towers and connecting walls. The two seaward towers have lower cannon ports as well. The fort is surrounded by a massive stone-faced defensive bank and there are a number of buildings inside. Desmond Castle (W637508) or the ‘‘French Prison’’, Kinsale is a small tower-house with a decorated doorway and some decorated windows. There are two unusual corner windows. St Multose’s Church (W637504) has a Norman tower with a round-headed doorway. Inside are the old town stocks and a carved stone, possibly a sheila-na-gig. There are a number of 17th century memorial stones on display. James Fort (W645497), on the other side of the harbour from Charles’ Fort, is a five-pointed artillery fort. It is very much overgrown with little of the stonework visible. In the middle of the fort is a stone castle with two towers and connecting buildings inside a rectangular bawn. The corner towers of the bawn project beyond the line of the curtain wall on the left. Close by at sea level is a small hexagonal fort. The remains of a castle (W636508) were noted in passing. Only one corner remains. A trivallate rath (W581461) was visited. The inner platform is about 60m diameter and the total diameter is about 100m. A small depression near the centre may indicate a collapsed souterrain. The ditches are about 3m deep and the entrance is at the south-east. A small rath (W568466) about 30m diameter was inspected. There are traces of an outer bank on the north side. 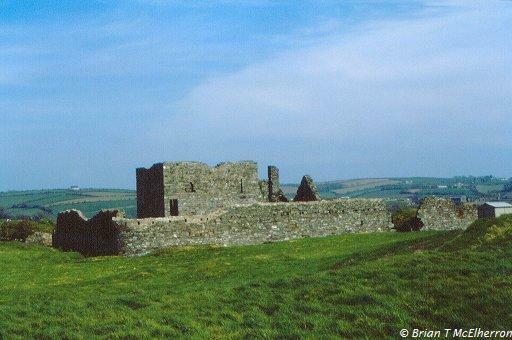 Kilbrittan Castle (W531472) is relatively modern but it may be built on an older structure. There is a grand double entrance stairway, incorporating a dove-cot. The gateway has a folding portcullis. Attached to the main house is another house with a circular corner tower. Timoleague Franciscan Friary (W472436) is an extensive range of buildings. There are a number of good transomed windows one with a mullion and a good head. There is little decoration in the church, a little at the door and a much-weathered carved head on the outer wall. The four pillars of the aisle arcade are all different; one is square, two are round with different capitals and one is elongated polygonal. The tall slender tower is typical of Franciscan Friaries. Some fragments of the cloister remain and there are two tomb niches with a little decoration. There is a bullaun-stone, the bullaun being about 20cm wide and 18cm deep. The remains of Timoleague Castle (W470440) were noted from the roadside. A Mass Rock was visited (W469463) and a large derelict mill noted (W473530). The first visit was to Blarney Castle (W606750). It is a large rectangular keep with a bartizan on three sides and a corner-tower, also with a bartizan. 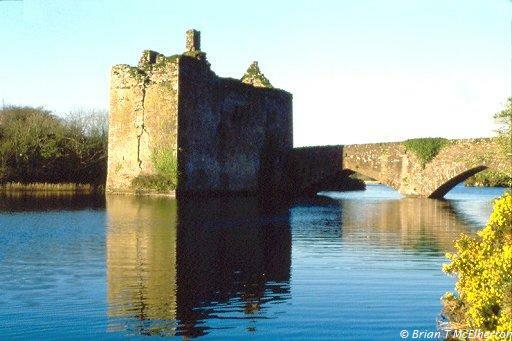 It sits on a rock and has substantial remains of a bawn with three turrets (one separate). At the base of the rock is a larger turret, known as the Dungeon. It has a rock-cut passage. Just inside the entrance to the castle is a murder-hole. The ceiling of the first-floor room is vaulted and there is an early 18th century fireplace. The vaulting supports a large room with three mullioned windows and a fireplace. Above this is the banqueting hall and above that is the Chapel. There are two spiral stairways from which may be entered a number of small rooms. These include a garderobe, the Earl’s room (with oriel window) and the kitchen (with two large fireplaces). There is a good uninterrupted roof-walk. 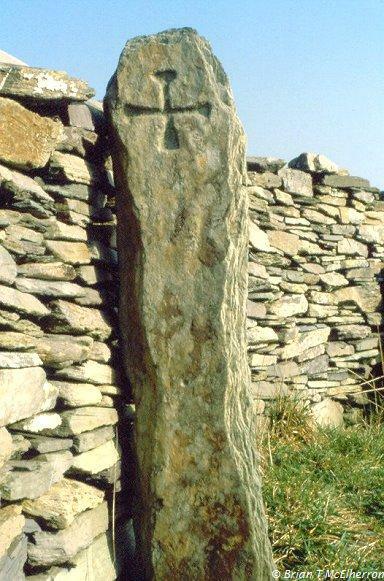 A large tapered standing-stone (W580776) was photographed. It is about 300cm high by 200cm wide at the base and 50cm thick. A large rath was inspected (W573783). It is about 60m diameter and has a massive bank and ditch. The bank is about 12m wide and the base and about 4m high. The ditch is about 6m wide and 4m deep. Another standing-stone was photographed (W538834). It is about 200cm high by 150cm wide and 40cm thick. 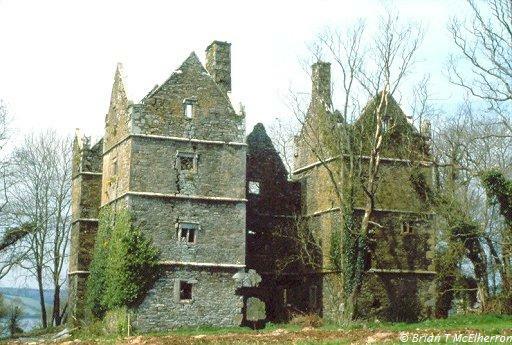 Mallow Castle (W563983) is an early 17th century fortified manor-house. There are two projecting towers at the corners of one long wall. Between them is a third tower and a fourth one projects from the middle of the opposite long wall. There are a number of good mullioned windows, some with transoms and a few fireplaces. The ruins of Mourne Abbey (W570923) were inspected. These comprise a rectangular ivy-covered church ruin and some boundary walls and the remains of a square tower. After some searching Island wedge-grave (W603908) was located. It is a typical wedge-grave with double walls and a kerb. There are a number of lintel stones and a lot of cairn material in place. 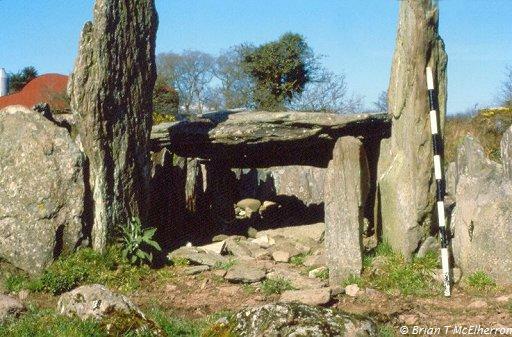 The portal-stones are about 1.5m high and the chamber is about 6m long and 1.3m wide at the front. A lime-kiln was noted (W568901). A small rath (W582835), about 30m diameter, was visited. It is heavily planted with trees and the bank is broken in several places. There are no traces of an outer bank or ditch. A large cylindrical detached belfry at Waterloo (W605782) was viewed. It has an 1836 Romanesque doorway and an 1845 date on the wall higher up. There is also a Greek inscription. Carrickadroichid Castle (W413723) was visited. It is built beside a bridge and has a rectangular projection on the long wall on the landward side. Half of this is circular within and may have contained the staircase. In the other half is a large fireplace. 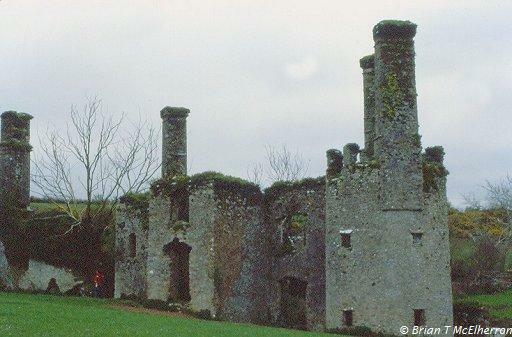 The remains of Macroom Castle (W337728) were viewed from the outside. These include substantial portions of the bawn wall and a corner tower with some good windows, possible Tudor. The ruins of a castle were spotted at Inishannon (W535575). At Templebryan, a circle of five stones was examined (W388437). The circle is incomplete and there is a central stone capped with quartz. Nearby (W387438) are the remains of a small church inside a stone enclosure. Near the church is a tall thin standing-stone with a faint cross inscribed. At the foot of the stone is a bullaun-stone. A rath at the roadside (W333353) was examined. It is about 35m diameter with a well-preserved bank. There is no trace of an outer bank or ditch. Rathbarry Church (W327352) is possibly early 19th century and has some mosaics, including two Chi Rho’s and alpha and omega. Close by is an earlier ivy-covered rectangular church with a piscina and a good three-light window. Rathbarry Castle (W323352) is incorporated in mid-19th century buildings. Only the ruins of a vaulted tower remain. Castle Freke (W322358) is a large ruined mansion. A killeen (W320370) was explored. It has the remains of a small church and there is a cross-base hidden under a gorse bush. Nearby is a spring, water from which is said not to boil. A rath was spotted in the next field (W318370). After some searching a stone circle was located (W309370). It is about 7m diameter and has 13 stones. Some more stones lie just outside the circle. Nearby is a small single-chambered grave with several cupmarks on the capstone. Coppinger’s Court (W261359) was visited. It is a large early 17th century fortified manor-house with a bartizan around most of the top. There are some good transoms windows and a number of chimney-stacks. It is a rectangular building with projecting wings at the corners of one long wall and a third projecting wing in the middle of the opposite wall. At the rear are the remains of an oven. A search was made for Drombeg Stone Circle and a well-cover was discovered (W247355). It is cylindrical with a conical roof, about 2m high and 2m diameter. 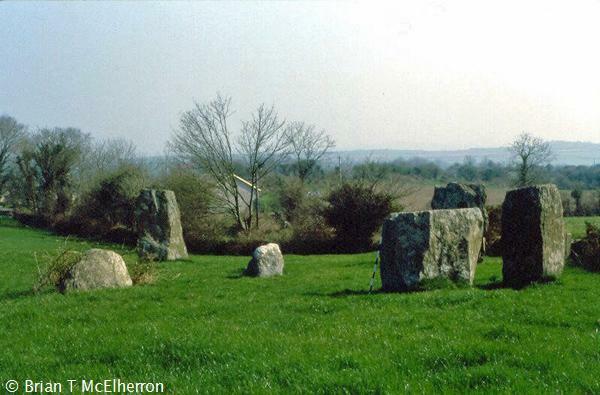 The stone circle was finally located (W247352). It is about 8m diameter and has 17 stones, one of them recumbent. Near the centre is a stone slab. The maximum height of the stones is about 2m. The recumbent stone is about 2m long by 90cm wide and 50cm thick. Nearby is a circular stone wall surrounding a rectangular stone-lined pit and a circular stone-lined pit. They are both flooded and this may be an ancient cooking place. Beside this are two conjoined hut-circles. The entrance is in the larger one and the smaller one has a hearth. Knockdrum Cashel (W170308) is a hill-top circular stone fort. Just at the entrance is a mural guard chamber. In the middle of the fort are the foundations of a rectangular house with a souterrain leading from one edge. The souterrain is stone-lined at the start and rock-cut further in. It is closed by a heavy iron grid. Just inside the entrance of the fort is a pillar stone, 140cm high, with two inscribed crosses. Just outside is a flat boulder with a large number of cupmarks. On the edge of a hill at the other side of the road (W173325) is an alignment of three stones with a fourth one lying down. The alignment is about 10m long and the tallest stone is more than 4m high. The shortest is more than 2m high. The recumbent stone is about 4m long. South of Castletownsend the ruins of Castle Haven (W176300) were inspected. There are scant remains of a tower, very much overgrown. Nearby is the gable of an old church. Ballinacarriga Castle (W288508) was visited. 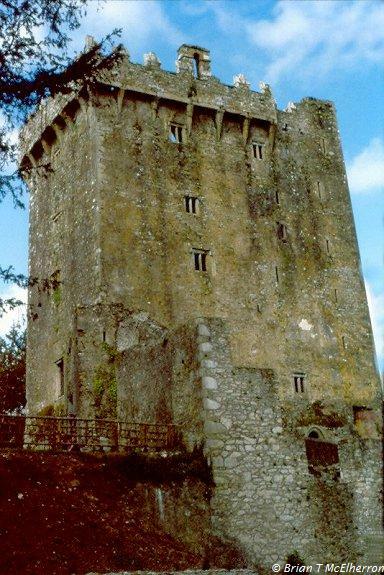 It is a tower-house set high on a rock with the remains of the corner turret of a bawn close by. There are two wall bartizans entered from the second floor room which has a vaulted ceiling. The first floor has a fireplace and a decorated window. A spiral stairway rises to the top room and a straight mural stairway goes to roof level. The top room has two windows decorated with scriptural subjects. There is a sheila-na-gig set high on the outside wall. Rapid progress was made northwards from Cork and two castles were noted in passing. One is a fine tower-house (R823013) standing four-square and the other (R799078) has only one wall standing. A stop was made at the bottom of the Rock of Dunamase (S530981). Dunamase Castle is set on a large rocky outcrop. A number of defensive earthworks lead to a D-shaped gatehouse with the remains of a curtain wall. Beyond this is an inner rectangular gatehouse also in a curtain wall with a corner tower. The rectangular keep on top of the rock is greatly ruined but has a good doorway and some good windows. Near Kilberry, the ivy-covered ruin of a church and a fragment of a castle (S655985) were investigated. There is little of interest. Kildare Cathedral (N725127) was visited. It houses a collection of carved stones including four effigy tombs. Beside the cathedral is a ring-headed plain High cross with a broken top. The Round Tower close by has a crenellated top and a Romanesque doorway over which is a triangular hood. Lynch’s Castle, Summerhill (N848480) was investigated. It is a tower-house with later additions. There are the remains of a vaulted ceiling on the first floor and a double latrine-chute, half of which leads from a garderobe on the first floor. A spiral stairway rises in the corner. About halfway up the first section of the stairs a deep recess leads to a defensive loop. There is another good loop to the left of the doorway, running diagonally through the wall to open just at the door jamb. There is a double chimney-stack. On the village green (N850485) is the shaft of a mid-16th century cross with carvings of vines and beasts on both sides. One narrow edge depicts a stag hunt. At Newtown Trim, the Friary and Hospital of St John the Baptist (N818568) is an extensive ruin with a residential tower at one end. The tower is vaulted above the ground floor. The church has a good three-light window and there are remains of a number of vaulted rooms. There are some remains of a curtain wall with a small corner turret. On the other side of the river are more ecclesiastical remains. Cathedral of SS Peter & Paul (N815568). A small church, separate from the main buildings, contains a double effigy tomb. The panels depict coats of arms and one short panel has kneeling weepers. Scattered on the tomb are a number of rusty pins and small pebbles which may indicate a local cure or good luck custom. On the outside wall of the church is a tomb niche with a decorated hood featuring a head with long plaited hair. The cathedral is a large rectangular church with some good lancet windows. There is a large double piscina (or small sedilia). Opposite this is a much-worn effigy set in a recess behind a grid. There is some decoration at the windows and on the doorway which is blocked. A corbel stone on the wall has a carved angel. There are some traces of mural passages. The domestic buildings nearby are extensive. There is one good decorated window and some of the small windows have pecked decoration.